Winter holidays in the Cairngorms are fun and refreshing! We have spent Hogmanay in the Highlands many times and it is wonderful. We have arrived to light snow on the lower ground and great powder in the mountains, with fresh mountain air to blow the Christmas cobwebs away. 7 days in the Highlands is my family’s idea of fabulousness, a week of the outdoors surrounded by beautiful scenery, eating fabulous food and spending the all important quality family time together. Our winter holidays in the Cairngorms is often kick-started by sledging at Muckrach. The children absolutely love the thrill of the lack of control as you thunder down a hill; get the plastic wedge out and drag them along the snow and push them down the hills for hours. 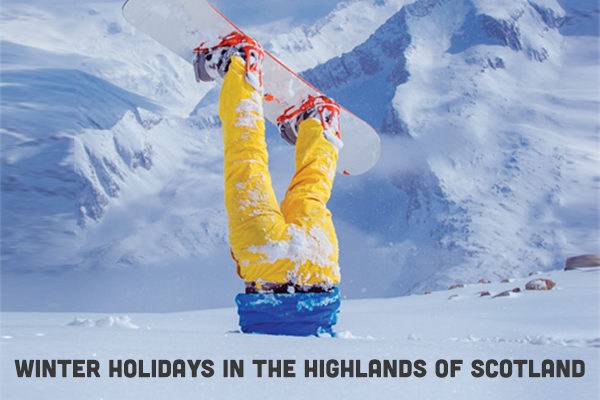 The perfect winter holiday in the Cairngorms; snow, sledging, snowman building and human-tobogganing! (Put my 7 year old son in a snow suit and he slides down anything like a human toboggan! All topped off by a hot chocolate indulgence, with the extras; cream and marshmallows from the coffee shop at the base station is a necessity! As you re-fuel with the warm sweetness, what more could your children ask for, what more could the adults ask for? Blissful family entertainment in a beautiful setting. Muckrach Country House Hotel is approximately 40 minutes from the Cairngorm mountain, where you can enjoy so many different activities on your winter holiday in the Cairngorms. Muckrach is a fully renovated 13 bedroom Victorian shooting lodge, re-developed as a 4 star luxury hotel with nods to Victoriana. Each room has been individually designed with your comfort in mind; the beds are Hypnos a company referred to as ‘the God of sleep’, the bar is well stocked with over 100 whiskies and a wide range of gins, the public rooms are filled with comfortable sofas & chairs, the walls are adorned with fabric wallpaper, floors with Axminster carpets and ceilings with chandeliers. The team will offer you a Highland welcome and the menu will be filled with chef-prepared, fresh delicious food. Non-residents will be welcomed to enjoy public rooms; whether you decide to have Lunch in the Coffee Shop, Afternoon Tea in the Drawing Room, drinks & nibbles in the Bar or Dinner in the evening, will be entirely your choice. Enjoy a stay at Muckrach should you wish to enjoy the thrill of the snow on the mountain, the views of the snow-capped mountain or to drag the youngest family members around in a sledge! We can give you the contact details to get your gear sorted for the snow ports and organise a taxi transfer to the mountains with a local taxi company.